At Indian River Financial Group, we believe that it is your financial goals, your life aspirations and your risk profile rather than a passing view of the markets that should drive your investment strategy. That’s why we work with you to develop a comprehensive financial plan with clearly defined goals, realistic timelines and actionable strategies before we put any math to your investment needs. We utilize the time tested Wealth Optimization System™ as our process for planning and managing our client’s wealth objectives. The overriding purpose of the process is to empower our clients to make smart decisions in managing their wealth while optimizing their resources for the best possible long term results. Throughout the process the emphasis is on what’s important to you - to bring clarity to your goals and priorities, to find creative solutions, to implement for results, and to manage your results for greater confidence in your future. Phase 1: Discovery – In this phase we take the time to identify and think about your concerns, your vision and your specific financial goals to gain clarity around your most important planning needs. Phase 2: Creative Solutions – Next we explore and identify solutions that can most effectively and efficiently address your planning needs. 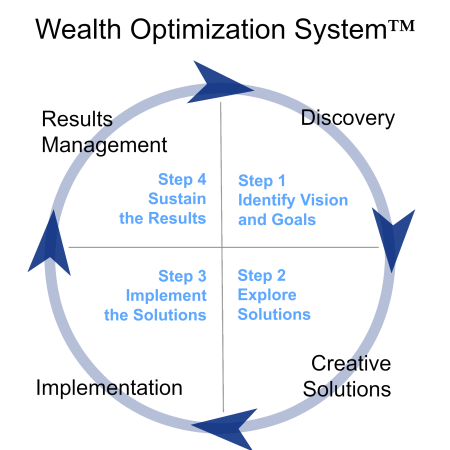 Phase 3: Implementation – We then formulate actionable strategies and tactics and map out a timeline for deploying them. Working with your other advisors, we ensure timely execution of your plan for optimum results. Phase 4: Results Management – In this ongoing phase, we manage the process of monitoring your plan and measuring results against established benchmarks. This will enable us to make the proper adjustments and sustain the results which will increase your confidence in your plan’s ability to achieve your objectives.